Our bodies protect us from foreign matter. Usually, that is a good thing. It urges us to take up what we need to survive – air, water and food – and everything else should better stay outside or it risks violent response from our internal army, the immune system. Such a response is bad for both parties: In an irony of nature, immune reactions can be so strong that they actually kill their purpose and the organism they intend to protect. There are medical interventions that necessitate bringing foreign matter into a body, implants for instance. In order to avoid an immune response, these devices are engineered to disguise their extraneousness. One way to do that is decorating the surfaces of biomedical devices with proteins the body recognizes as its own or at least as non-threatening (“surface functionalization”). An even better way to do that is masking the devices with peptides, short amino acid chains. Why peptides? Because proteins have to be produced in bacteria (and consequently extensively purified) while peptides can be synthesized in a chemical laboratory, far away from any pathogenic threat. In addition, peptides are not as fragile as proteins and can survive comparatively harsh treatment. Once the material – biomedical device and peptides – is ready, the next challenge is to place the peptides on the surface such that they can efficiently interact with the cells around them. But how to control the orientation and density of such short and diverse species? In a study published in Nature Communciations, a team led by Marcela Bilek used variations in solution pH and electric fields to make the peptides dance to their tune. By varying the solution pH and the orientation of the electric field, they could control how a peptide approaches a surface. The surface in this experiment was a so-called radical-functionalised plasma polymer. This material had two features that were useful for the study: Firstly, its charge can be tuned by varying the pH of the immersive solution. Secondly, it is very “sticky”, reacting quickly when the peptide is close enough and binding it at the end that is closest to the surface. The peptide Bilek and her team designed for their study had two differently featured ends: One was hydrophobic, the other one a dipole (1 positively charged amino acid residue on the terminus followed by 4 negatively charged ones), which gave the peptide – at maximum – a net charge of -4 e. With these materials handy, the team set out to determine how different pH and electric fields can be used to puppeteer the peptide. At a lower pH (pH 5.4), the surface charge of their test material was low and the peptides bound to it in high density, yet random orientation. 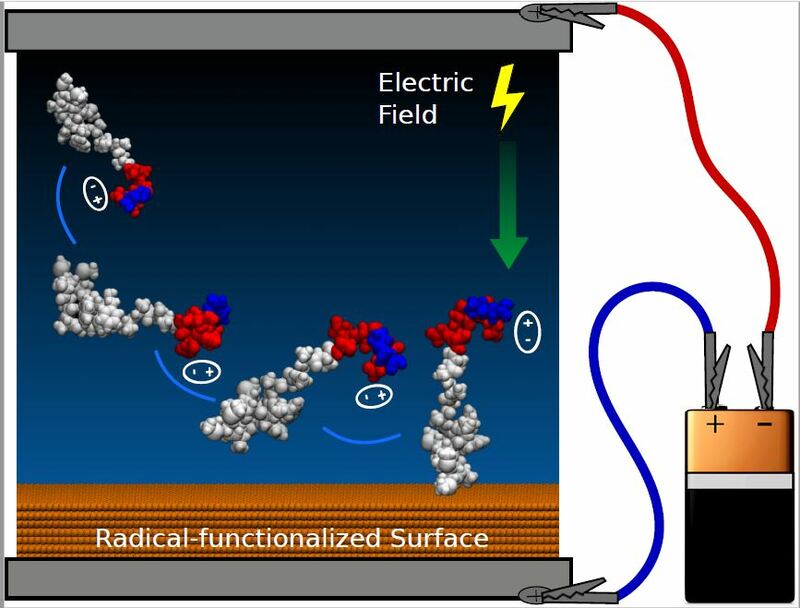 At pH 9.8, the surface was negatively charged and the peptides had to overcome the resultant potential barrier and were pressed to align their dipole moment with the electric field. That led to less but uniformly oriented peptides on the surface. Obviously, when it comes to surface charge, there is only so much one can do with pH variations. Therefore, Bilek and her team next used an external electric field. Clipping the positive pole to the lower (i.e. surface) plate, thus charging the surface of the test material positively, led to a high density of peptides, predominantly oriented with the charged dipole end attached to the plate. Flipping the electric field around (i.e. charging the surface of the test material negatively), repelled the peptide. This led to a lower density of peptides, and those binding were bound at their hydrophobic end. It sounds simple. Probably, because it is. And that is part of the beauty of this study: It is a simple solution to a complex problem. Bilek and her team exploited the principle of electrical charge repulsion and attraction to get the peptide coat they desire for their test surface. Often times, intriguing research is not complicated, it is simple but clever.